Digital technology makes life easier in many ways, but the analog interactions we have ditched in the name of progress made life more meaningful if not substantial. 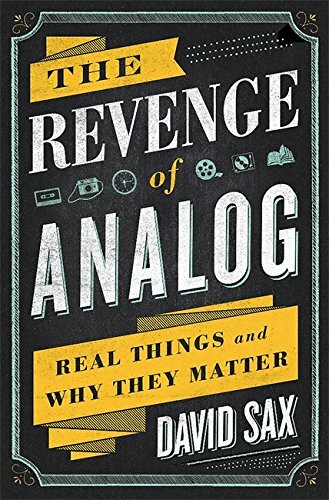 Or so argues David Sax in The Revenge of Analog, his call to reexamine the first-hand, in-person experiences we have given up in the name of technological progress. Sax is not a luddite. He doesn't romanticize a pre-Internet age. Indeed, he heartily celebrates the change that digital technology has wrought and the benefits it yet promises. Yet he gives readers pause when recounting stories of numerous individuals who still relish the tactile, sensuous experience of reading a story from a hand-held book; of listening to music on vinyl LPs; of penciling notes or dashing off sketches in Moleskein notebooks to say nothing of the resurgence of fountain pens; of taking photographs on film and then printing them out as silver grains on paper. The biggest problem with digital photoraphy, Sax says, is that "it isn't real." And the more pictures you take, the more meaningless they become. Online giants like Apple and Warby Parker have realized the extent to which customers appreciate an in-person shopping experience. Sax notes that the more time spent shopping on line the more stressful its endless comparisons make you. Ancillary aspects of vinyl listening are described as sensousness itself: the "physical browsing of album spines," the "careful examination of the cover art," the "diligent needle drop and that one-second pause between its contact . . . and the first scratchy waves of sound." To judge by numbers Sax is on to something, because objective measures show that afficianados of the analog are growing steadily. They speak about the "finishability" of a novel or magazine piece—meaning the ability to actually get to the end—and about the "reading experience" itself. A news website by defintion can never be finished becuase it consists of nothing more than a "constant stream of updates." In the same vein analog board games on offer at cafes, bars, and restaurants "draw customers in" and "foster a sense of community." Sax cites the venerable Monocle magazine as a successful analog entity that has built a long-term relationship with its readers. A given issue lives on for years after its publication. But "if we have an article on a website or the iPad, people see it only once." Education technology comes in for particularly harsh scrutiny. It is the antithesis of unstructured play. Screen swipes are no match for finger painting or hands-on activities. While technology "presents such a beautifully simply solution to the intractible problem of educational inequality," most technology outreach efforts have been "a colossal failure," and the introduction of computers has done nothing to improve learning. We have lived with personal computers for more than 30 years, with the web for 20, and with smartphones for a decade. What makes one tool superior to another, Sax says, "has nothing to do with how new it is. What matters is how enlarges or diminishes us."